Chris Huhne has only been an MP since last May's general election, yet he quickly found a place on the Liberal Democrat front bench before deciding to contest the party's leadership. While the ambitious former journalist has had difficulty shaking off the "Johnny-come-lately" tag, he is certainly no political novice. Key quote: "It is a time for new ideas and new horizons"
The 51-year-old is married to high-flier Vicky Pryce, who is chief economist at the Department for Trade and Industry - a department he would like to see abolished. The couple have three children together, plus two from Ms Pryce's previous marriage. 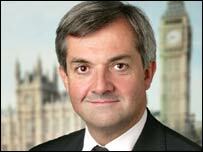 Mr Huhne won his parliamentary spurs in Brussels and Strasbourg as an MEP from 1999 to 2005. And he has argued throughout his campaign that his years in newspapers, business and the European Parliament make him more suitable for the leadership than either of his rivals, despite their many years of experience in Westminster. Mr Huhne, 51, became MP for Eastleigh in May, 2005, with a majority of 568 - by far the smallest of the three contenders. Within months he was appointed as the Lib Dems' Treasury spokesman, dealing with tax and public spending. He was educated at Westminster School, The Sorbonne and Magdalen College, Oxford. He worked as a City economist and as an economic journalist on The Guardian, The Independent and The Economist. He has written four books, mainly on the themes of third-world debt and development and European integration. His latest offering, "Both Sides of the Coin" argues the case for British membership of the euro. He stood as a candidate for the SDP-Liberal Alliance in Reading East (1983) and Oxford West and Abingdon (1987) general elections, but it was as MEP for south east England that he first entered Parliament in 1999, albeit the European one. He acted as deputy leader of the Lib Dem group there and served on the Economic and Monetary Affairs Committee, focusing on economic and financial policy, including regulation of the financial sector. Mr Huhne has long been one of the party's key thinkers and in 2002 he took charge of revamping Lib Dem policies on public services. The plans included replacing council tax with a local income tax - a flagship Lib Dem policy at the last election - and earmarking national insurance money as a ring-fenced tax to fund the NHS. Other plans to decentralise control of healthcare and education, and to continue allow private firms to do some NHS work, came under attack from some Lib Dems but were approved by the party's conference. During the leadership contest, Mr Huhne has called for higher environmental taxes to combat global warming and pollution, combined with lower taxes for the least well-off. He has also argued for a "radical decentralisation" of the state and against identity cards.